As Temperatures Warm, Beware These Signs of AC Repair Needs | Fresh Air, L.P. Temperatures are climbing back up, and if you haven’t already it’s almost time to turn on your air conditioner. Air conditioners are an absolute necessity here in Sugar Land, which is why you should make sure you keep yours in good shape. The middle of summer is the most common time of the year for problems to develop with AC systems, because of the immense strain they’re put under. But yours can stay in good shape throughout the spring and summer seasons! You can achieve this first by scheduling maintenance, if you haven’t done so already. Next, you should keep an eye out for warning signs that your air conditioner is in bad shape. The faster you can identify that your cooling system is having trouble, the faster you can get it repaired and the better off your home will be. What are these signs? After a few seasons of using your air conditioner, you should be pretty familiar with the everyday sounds it makes during operation. 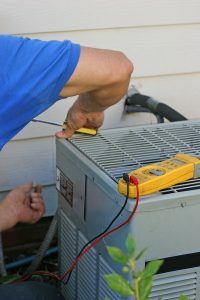 If your AC system suddenly begins making strange noises, it’s definitely a sign you should call for repairs. Unusual sounds could mean a number of different things, depending on the specific noise. For instance, hissing or bubbling sounds mean you air bubbles in the refrigerant lines, which likely means you have a refrigerant leak. Grinding noises are a sign that your cooling system’s air handler is experiencing more friction than it should be. This probably means that the bearings in the air handler motor are failing, and need to be replaced. You should have this looked at right away, before the motor overheats and burns out as a result. These are just a few examples of odd noises you might hear from your air conditioner. Really, anything that sounds off or unfamiliar to you is worth having investigated. One of the first indications that an air conditioner is experiencing trouble is a drop in output from the system. Just like with strange noises, this problem can manifest in a number of different ways and have a number of different possible causes. Is your cooling system still blowing air, but that air doesn’t feel cold? It may be due to a refrigerant leak depriving the system of its output capacity. Is the AC system not circulating much air at all? You might have a clogged air filter, or potentially a problem with the air handler. Regardless, low output isn’t a good sign. You should have a professional check your air conditioner thoroughly if you’re experiencing this. If your cooling system is turning on and off every few minutes rather than going through a few cycles each hour, you’re dealing with what’s called short-cycling. It dramatically increases the amount of wear and tear that the system suffers. Short-cycling also lowers the amount of output the system is capable of generating and also shortens its lifespan. Be sure to have your system inspected if you notice this problem. Contact Fresh Air, L.P. for professional AC repair in Sugar Land, TX.